Whoa, guess how many earthworms live in an acre of land? Answer: 250,000 in poor soil and up to 1,750,000 in rich soil [source: Rothamsted Research]. I’m not a big worm buy, but my 6-year-old is so I’ve been handling and looking for more worms than I ever have in my entire life. Which got me thinking about worms and in turn inspired this article. While I break down worm types into 9 types of worms, there are actually over 1 million species of worms. Obviously I couldn’t possibly list all of those. Instead, I researched and list the 3 main species followed by the 3 main types as to their function (compost, earth-worker and root-dwelling worms). Here’s our list. Anecic earthworms usually make vertical tunnels in the ground, so you can recognize them by the mounds of dirt that surround the tunnel entrances. The decaying matter found on the top part of the soil is what these earthworms eat, and an example is the Lumbricus terrestris, or the common nightcrawler, as well as dew worms and blackhead worms. They actually drag the soil’s organic matter to the surface into their burrow to eat, and they also eat the soil itself. Their burrows can be up to five or six feet deep in the soil, and they are also known as subsoil dwellers. Once they digest their food, the castings provide vital nutrients to the plants surrounding the area, which is why it is so healthy for plants to have these worms underneath the soil. This is especially common in various grasslands, although these are also the type of worm that people use for bait. Anecic earthworms grow to between three and six inches long, and they are very commonly found in the average home garden. According to most experts, these types of earthworms only come up to the soil’s surface when there is so much rain outside that they are in danger of drowning in their tunnels, which is why their name means “within the earth” in Greek. Also known as topsoil dwellers, they build burrows underground that are quite large, but are only temporary in nature, and they feed mostly on any organic material that is already found mixed in with the soil. The burrows are also horizontal, not vertical like the anecic earthworms’ burrows. As they eat, they enrich and process the soil, making them an important part of many different types of agricultural enterprises and ecosystems. Endogeic earthworms come in colors that include green, blue, grey, and pale pink. Unlike most other types of earthworms, epigeic earthworms – also called litter dwellers – live most of their life above ground, which is why they never construct permanent burrows below the surface of the earth. Like anecic earthworms, they eat dead and decaying organic matter found scattered all over the ground. Compost worms are included in this category, as are manure worms, and all epigeic earthworms can consume large amounts of waste daily. They are very commonly found in farmlands. Compost worms live within the top four to five inches of topsoil and feed on vegetable matter. They do not eat soil like other earthworms do. In addition to regular garden soil, compost worms can also be found in leaf piles and manure piles. Instead of permanent burrows, they build burrows randomly throughout the rotting matter and the topsoil, and they are especially fond of fungi and bacteria. When the weather is particularly hot or cold, these worms will ball up and burrow further down into the soil, using slime to cover themselves and remain moist. They also hibernate in order to conserve energy. Also known as the regular tiger worm, this worm is dark-red or purple in color and often has stripes. They also get up to approximately five inches in length. The common names for this worm include the brandling worm, manure worm, or the tiger worm; its color is a rust-brown and it has yellow stripes, and it can grow up to five inches long. 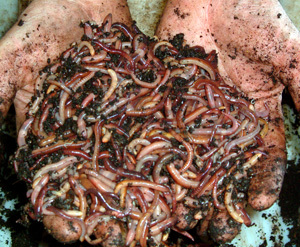 Here is a photograph of these types of worms: https://www.wormcomposting.ca/images/redworms2.jpg. Also called the blue-nose worm or the dendra worm, these worms can be olive-brown, purple, or violet, sometimes having stripes. They can also get to over six inches in length. This is what the Dendrobaena venta look like: http://www.bucketofworms.co.uk/img/cms/wormsin_hand.jpg. Also known as a red wiggler, redworm, or bloodworm, these worms are dark-red or maroon in color with a light-yellow underbelly and no stripes. They get to roughly four inches in length. The redworm looks like this: http://www.ukwildlife.net/amphsmollusc/pics/52Lumbricus%20rubellus%201.jpg. 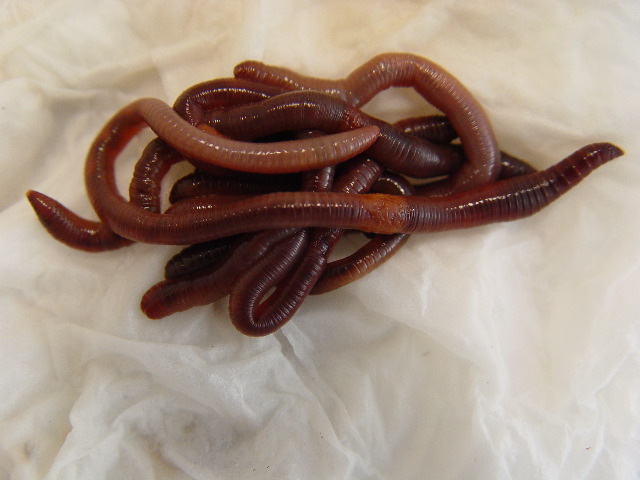 Of all of the worms you may find in your garden, the earth-worker worms are the most common, especially the Lumbricus terrestris. They make long burrows up to a few feet deep, and often the casts found at the entrances are made up of their poop. They like soil, but love leaves, and they even have preferences when it comes to various types of leaves. They are nocturnal, searching for food in the nighttime, and they even use leaves to cover up their burrows. With a lifestyle that is almost the complete opposite of epigeic earthworms, these worms are never seen above ground. They burrow very deep, even living among the roots of the plants, and are found quite frequently in farmland of various types. Two examples of root-dwelling earthworms are the Didymogaster sylvaticus, a squirting worm; and the Australian Megascolides australis, which is very large. Because of their time underground, these types of worms are difficult to find and very rare. Earthworms breathe through their skin because they have no lungs or other specialized respiratory organs. Worldwide, there are roughly 6,000 species of earthworms. One of the most common types is the nightcrawler, which is also called the rainworm and the angleworm. All earthworms produce both egg and sperm, as they are all both male and female. They always mate on the surface of the earth and press their bodies together, exchanging sperm before they separate. Earthworms can eat almost anything, but most of them have a diet that consists mostly of fallen leaves and surrounding soil and dirt. In the United States, most earthworms are between half-an-inch long to around 14 inches in length, although in other parts of the world they can get up to 10 feet long. Earthworms have skin with a lubrication on it, making it “oily” enough to keep themselves moist and easier to burrow underground.